I finally decided to take my tauren to Draenor. Although my main is Alliance, I made this tauren warrior back in 2007 to see the other side of WOW. I don't jump in and level quickly. It's really a "What this like" toon. It helps with leveling, that I've done this Alliance side. I know where to go and what to do when doing the starter quests to get to Frostfire Ridge. And, having done the beta, some things are burned into my memory. 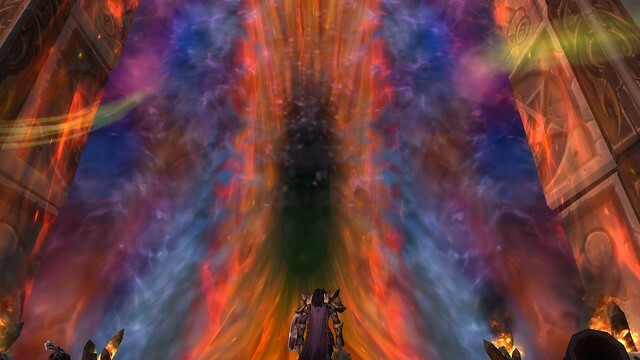 The portal between Draenor and Azeroth is one thing. I love the colors. I love the swirls. When we deactivate the portal and then destroy it, I felt a sadness, not because of the theme of the Iron Horde invading, but the loss of the pretty colors. I'm anxious to see how this all plays out. Will we restore the portal and get the colors back or has it been irrevocably changed?